The highs and lows of being an NBA fan aren’t necessarily dependent on wins and losses. When your team has been bad for a while, small victories — like upsetting a better team during the regular season — can be your version of winning a championship. Conversely, when your team is a finals contender every year, some setbacks can feel like signs of the end times. One way to quantify the ups and downs of a fan base is to look at how active they are: After all, the only fans worse than angry fans are uninterested ones. To help with that, we have Reddit — the discussion-based website with more than a million communities, or subreddits, each devoted to a different subject. Over the years, basketball fans have flocked to /r/nba, the site’s professional basketball subreddit, to discuss games in progress, seek meaning in the latest trade rumors and debate the legality of surrounding Steph Curry in a moving ring of teammates with locked arms. With more than 11 million comments made from January through October, /r/nba is the third most active subreddit this year, trailing only /r/AskReddit and /r/politics. It’s also far and away the busiest sports subreddit: Through October, /r/nba had received 3 million more comments this year than /r/soccer, the next most active sports-related subreddit. One noteworthy aspect of /r/nba is that users have the option to publicly display their allegiance to teams through “flairs,” which appear as icons next to usernames in posts and comments. Although flairs are optional, roughly 80 percent of comments made on /r/nba since October 2011 have been made by users with those icons. 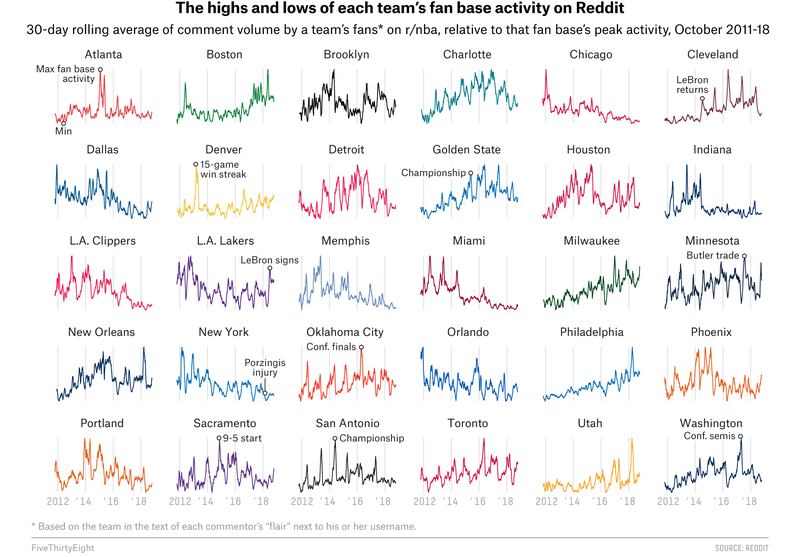 Inspired by Reddit user 808x’s analysis of team loyalty, we used those flairs on comments made since Oct. 1, 2011,1 to chart the activity of each NBA fan base. To normalize for the growth of Reddit over time, we calculated the total number of daily comments made by a fan base divided by the total number of daily comments made by all users (flaired or not). In addition, we used a 30-day rolling average2 indexed to each team’s highest point in order to make the trends for teams in small markets as clear as the trends for teams in large markets. Indexing allows us to show all 30 teams at once, but cross-team comparisons must be made with caution because the y-axis for each team’s chart is unique. In other words, each fan base’s activity is relative only to itself. We can infer from the data that 76ers fans on Reddit were more active earlier this year than they had ever been, but we shouldn’t infer that 76ers fans were more active than Warriors fans. The spikes on the charts often correlate with playoff runs, blockbuster trades or better-than-expected starts to a season. For example, the fever of Atlanta Hawks fandom peaked during their 60-win season in 2014-15, which culminated in an appearance in the Eastern Conference finals. The spike on Minnesota’s chart lines up with the summer the Timberwolves traded for Jimmy Butler. Meanwhile, Sacramento Kings fans were most active during the start of the 2014-15 NBA season, when the team jumped out to a 9-5 record (they finished 29-53). To understand the landscape of fandom on /r/nba, it’s worth examining in detail the comment activity for fans of the Philadelphia 76ers, the Cleveland Cavaliers, the Los Angeles Lakers and the New Orleans Pelicans. 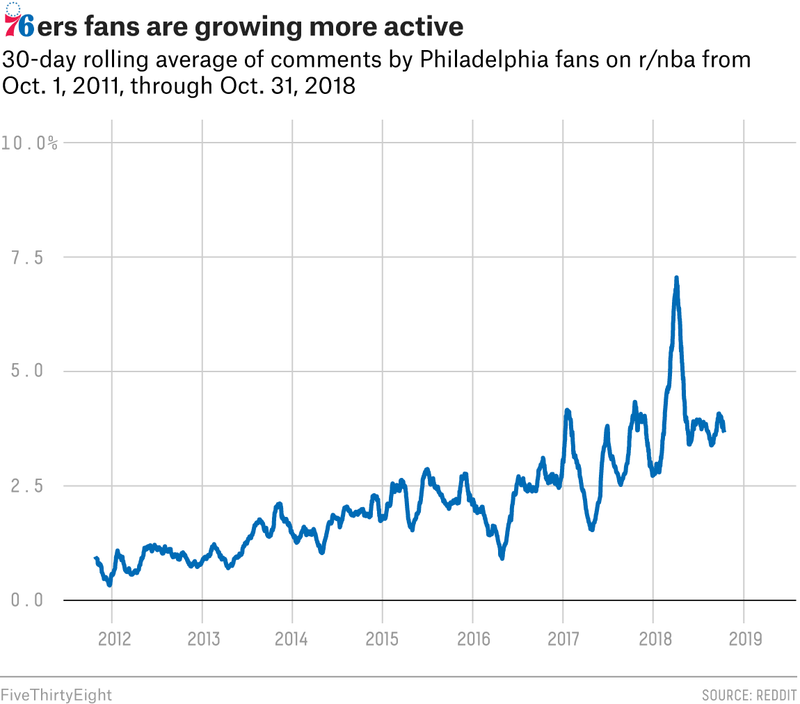 No team has had a more linear increase in comment activity over the past seven years than the Philadelphia 76ers. Sixers fans have grown more active on /r/nba each year, in part because their team has gotten incrementally better each year. But the 76ers also have two players on their roster who are a lightning rod for discussion on /r/nba. Hardly a day goes by without a post on the latest Joel Embiid sound bite or Markelle Fultz lowlight (when he’s not injured or involved in trade rumors). So long as those two players are on the team, Philly fans will have plenty to talk about. Because the data is available only through Oct. 31, 2018, the chart does not capture the reaction to Philadelphia’s trade for Butler earlier this month. But given that the replays of Butler’s game winners against Charlotte and Brooklyn are two of the most-upvoted, or highest-rated, posts of the season thus far on r/nba, 76ers fans are likely just warming up. When LeBron James returned to Cleveland in the summer of 2014, Cavaliers fans instantly became more active on /r/nba. With their teammate squabbles, midseason trades and postseason heroics, the Cavaliers were a constant topic of conversation from 2014 to 2018 — and never more so than during their championship run in 2016. But when James left to join the Lakers this offseason, he took the conversation with him. 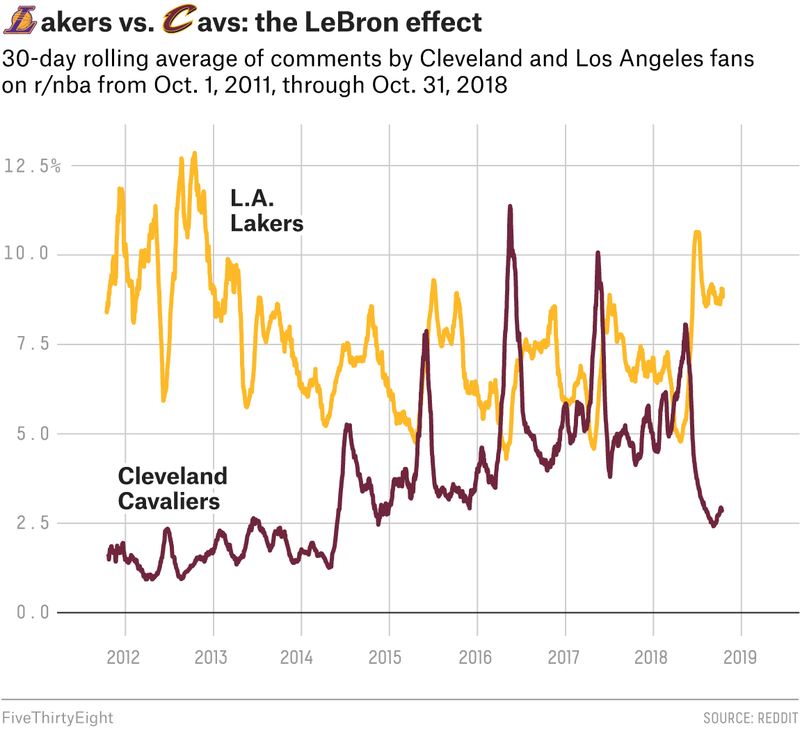 We charted the comment activity for fans of the Lakers and Cavaliers together, without indexing the shares so that we could make a cross-team comparison. The most-upvoted post of all time on /r/nba is the announcement that LeBron would sign with the Lakers. Ever since then, the L.A. fan base, which is one of the largest on /r/nba, has been more active than usual. Meanwhile, comment activity among Cleveland fans is the lowest it’s been since the first post-LeBron era. The New Orleans Pelicans exist in one of the smallest media markets in the NBA. Their team-specific subreddit, /r/NOLAPelicans, has the second fewest subscribers among all 30 teams (/r/memphisgrizzlies has the fewest). And yet, their fan base is in the middle of one of its most active periods. For every subscriber to /r/NOLAPelicans, Pelicans’ fans made more than 1.2 comments on /r/nba in the month of October, the highest mark of any fan base. Subscribers were counted on Oct. 9. Subscribers to r/warriors are likely inflated because of a feature of Reddit’s mobile app. If Anthony Davis decides to stay in New Orleans beyond his current contract, it’s likely to be in part because of the small but passionate fan base that supports him. It’s worth pointing out that Golden State Warriors fans rank dead last in comments per subscriber. But this is probably misleading because of the inflated subscriber count of /r/warriors. During the summer of 2017, those who downloaded Reddit’s mobile app were subscribed to the Warriors subreddit by default if they selected the NBA as a category they were interested in. This resulted in a spike in subscribers to /r/warriors and created a gap between them and the rest of the league. Although the /r/nba subreddit has existed since 2008, the 2011-12 season was the first year with sustained and regular comment activity from all 30 fan bases. To smooth out the daily volatility of comments. Owen Phillips is a data analyst and writer living in Brooklyn. His work can be found on NPR, The Outline and The Awl.